The early bird offer will expire 31st March 2014. In addition to the online ticket vendor, there are ticket outlets which may be nearby your location.The offer ranges from RM15 (1-day child) to RM55 (2-day Adult). If you are living in Brunei Darussalam, the ticket outlets are MegaBorneo Tour Planner, Pan Bright Travel Service and Century Travel Center Sdn. Bhd. For those living in Bekasi and Bali, Indonesia, the outlets are Destination Sabah Sarawak Indonesia representative office and Pan Bright Travel Service respectively. Pan Bright Travel Service, Kota Kinabalu, Sabah is the appointed festival ticket outlet. Sarawakians can check out their nearest outlets here. 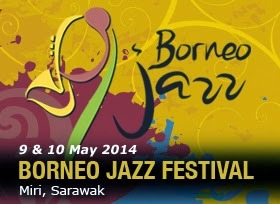 The 2014 will be the ninth (9th) edition and it is held in Miri, Sarawak. This year, the performers are JunkOFunc (Malaysia), Vocal Sampling (Cuba), Brassballett (Germany), Mario Canonge (Martinique), Iriao (Georgia), YK Samarinda (Indonesia) and Diana Liu (Malaysia).